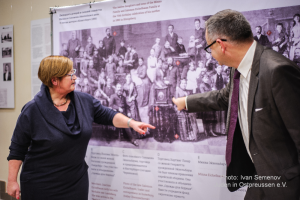 Explaining the huge Eichelbaum Family pictureThe exhibition contains many documents and photos about the Jewish Citizens of Konigsberg. 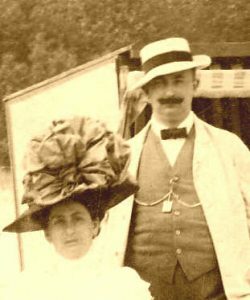 They were active in the fields of economy, science, health, architecture, infrastructure, art and culture and finance at the end of the 19th Century. Jews were an important part of the cities society at this period. 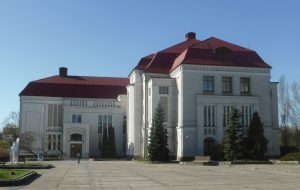 Many traces of their activities are still visible in the city of today. 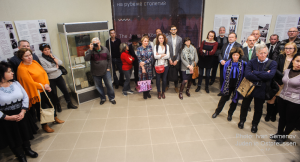 The opening was attended by many visitors: Members of the Jewish community, descendans of Jews in Königsberg from abroad, visitors fom the Lithuanian border area, diplomats of Germany and Lithuania, the local Rabbi, photographers, journalists, TV teams and important repesentatives of the foundation that is now rebuilding the synagogue of Koenigsberg. 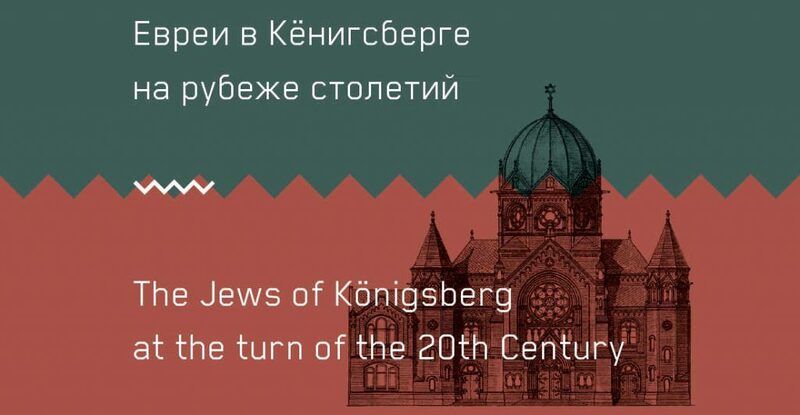 Today, at a point in time in which the reconstruction of the synagogue in Kaliningrad is actively underway, there is the question as to who these Jews ere who lived in Königsberg around the turn of the century when the synagogue on Lindenstrasse was being built: What was their life like? What kinds of things did they do? How did they think of themselves? The Jewish society at that time was quite heterogeneous. Many families came from the most different of places and regions. And that is no different today. 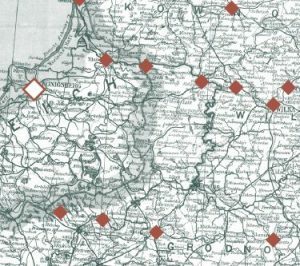 The “Association of Jews in East Prussia”, which initiated and organized this exhibit, set for itself the goals, firstly, of bringing current residents closer to the histories of the Jews in the time before the Second World War and, secondly, of providing some answers as to the topography of the forebears of the descendants of East Prussian Jews, the latter now scattered all over the world. 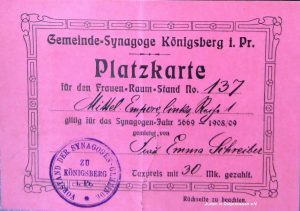 This exhibit, which can take place thanks to the generous support of Königsberg Jews and their descendants, is an important event. To all who have been involved, a very warm thanks. A special thanks is due the Historical Museum whose support made possible the bringing of the plan to fruition. 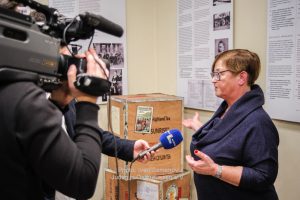 The opening of the exhibit on 9 November unites the visitors – both the descendants of the Königsberg Jews as well as today’s residents – in a shared reflection on the November pogrom. 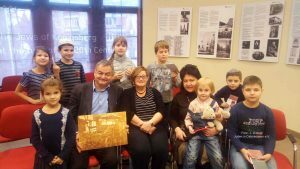 We had the opportunity to guide special interest groups – like the German language students of the local Goethe Institute and the Kids of the Jewish congregation. The heared stories about tea trading to Russia, about the first cars in the city and were impressed, that houses they know were built by Jews. It is important for one’s own identity to know that there was a large and proud Jewish community in this city that helped to shape their city. Koenigsberg was an important center of Jewish music at the turn of the 20th century. 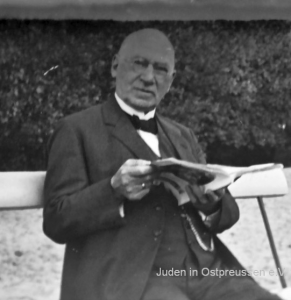 Arnold Nadel (1878-1943), an outstanding musician and an important figure of Jewish culture, spent a few years here, which were to determine largely his later activities. About Prof. Jascha Nemtsov from Berlin, he was born in Magadan (Siberia) and grew up in Saint Petersburg. 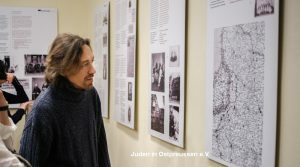 He is a pianist and musicologist, professor, head of the Department of the History of Jewish Music at the Musical Academy Liszt in Weimar Jascha Nemtsov recorded more than 30 CDs with the first performances of the works of forgotten Jewish composers. Aron Liebeck is our main narrator in the exhibition. In his memoirs he describes things that others did not consider important. We learn a lot about the hard lives of migrants and retailers in East Prussia, about his arduous rise from the position of an apprentice. The inside views of an accountant reveal the many failed business models that are part of normal life. He describes the social life of the time and what role clubs played in the process. He describes technical innovations and their effects. We learn a lot about the family life of the time and what is considered happiness. 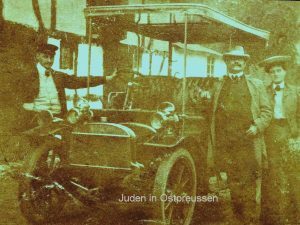 Many young Jews, willing to work and anxious to get ahead, moved from the ‘Pale of Settlement’ to Königsberg. The summer month were spent at the coastal resort of Cranz, where many families had built summer villas.